Since the early 1980s, private equity investors have heralded and shepherded massive changes in American capitalism. From outsourcing to excessive debt taking, private equity investment helped normalize once-taboo business strategies while growing into an over $3 trillion industry in control of thousands of companies and millions of workers. Daniel Scott Souleles opens a window into the rarefied world of private equity investing through ethnographic fieldwork on private equity financiers. Songs of Profit, Songs of Loss documents how and why investors buy, manage, and sell the companies that they do; presents the ins and outs of private equity deals, management, and valuation; and explains the historical context that gave rise to private equity and other forms of investor-led capitalism. In addition to providing invaluable ethnographic insight, Songs of Profit, Songs of Loss is also an anthropological study of inequality as Souleles connects the core components of financial capitalism to economic disparities. Souleles uses local ideas of “value” and “time” to frame the ways private equity investors comprehend their work and to show how they justify the prosperity and poverty they create. Throughout, Souleles argues that understanding private equity investors as contrasted with others in society writ large is essential to fully understanding private equity within the larger context of capitalism in the United States. 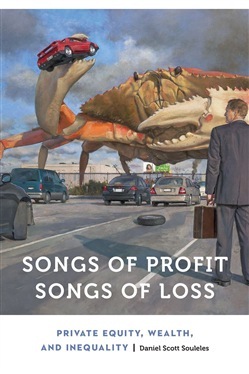 Acquista Songs of Profit, Songs of Loss in Epub: dopo aver letto l’ebook Songs of Profit, Songs of Loss di Daniel Scott Souleles ti invitiamo a lasciarci una Recensione qui sotto: sarà utile agli utenti che non abbiano ancora letto questo libro e che vogliano avere delle opinioni altrui. L’opinione su di un libro è molto soggettiva e per questo leggere eventuali recensioni negative non ci dovrà frenare dall’acquisto, anzi dovrà spingerci ad acquistare il libro in fretta per poter dire la nostra ed eventualmente smentire quanto commentato da altri, contribuendo ad arricchire più possibile i commenti e dare sempre più spunti di confronto al pubblico online.